I'm not sure that the current field is clear enough on what it's actually reporting. In my experience these compilations are more likely to be marketed with a number of "levels" rather than a number of "WADs" which can be a relevant distinction when a single .WAD sometimes contains multiple levels. This also makes it more difficult to test the veracity of the publisher's claims. I know it's a bit of a problem determining "levels" vs. "WADs" but it's still useful information to judge the relative size of the compilations by. However I would request that you not include/add things like "1000's" - if you are unable to get an actual numeric figure and cannot download and mount the image to manually count, then don't include the information at all. 200 BEST GAMES OF ALL GENRES. FAVORITE (Best) (Russian) - ? 200 BEST GAMES OF ALL GENRES 13. 3D Action & Arcades (Russian) - ? Amiga Format CD #24 - ? Amiga Format CD #31 - ? Amiga Format CD #39 - ? Club Software 1996 Doom WADS - ? Cream of the Crop (#3-11, #20-26) - ? Cobra Doom Utilities 2nd Ed - ? Doom Add-On Levels Volume 1 - ? Doom Add Ons - ? Doom CD ROM (Walnut Creek) - ? Doom Deluxe CD-ROM - ? Doom Game Pack #1 - ? Doom Game Pack #2 - ? Doom Game Pack #3 - ? Doom Game Pack #4 - ? Doom II Heretic Hexen CD Book - ? Doom II Mania!!! #2 - ? Doom Mega Set - ? Doom Utilities II - ? Doomania: il passaporto per l'Inferno - ? Dooms Day Collection v2 - ? Game Box Vol 1 - ? Game Cheat Gallery - ? Gold Medal Software (Volumes 3-5) - ? Hell on CD-ROM - ? Instant Doom Levels 2.0 - ? January 1995 Current Shareware - ? July 1994 Current Shareware Volume II - ? Mega WAD Vol I - ? Mega WAD Vol II - ? New Horizons Shareware Collection - ? Night Owl Games 3 - ? Night Owl (#13, #15, #16-18, #20) - ? PC Gamer Coverdisc 024 (Italian) - ? PC Gamer Coverdisc 025 (Italian) - ? PC Gamer Coverdisc 027 (Italian) - ? PC Gamer Coverdisc 031 (Italian) - ? PC Gamer CD #11 - ? PC Home 19 - ? PC Review Issue 60 CD-ROM - ? PSL Monthly Volume #3-10: Education - ? Shareware Extravaganza 8 - ? So Much Shareware 6 - ? Software Vault: Diamond - ? Sprint Gamers Companion 5 - ? Soundblaster Multimedia Experience Volume 4 - ? Supergames Volume 1 - ? Supergames Volume 5 - ? Supergames Volume 6 - ? The Hacker's Encyclopedia '98 - ? The Home Edutainment Collection Volume 4 3D Games and Extensions (Aztech New Media Corp) - ? The Pier Shareware (#5-10) - ? The Q Files - ? The Toom Parade CDR2028 - ? The Toom Parade CDR2133 - ? The Ultimate WAD Pack - ? Toolkit for Doom Volum 2 - ? Total Ruin 2 - ? Ultimate Add-On's Tournament Edition - >2500? Ultimate Gameware Collection - ? Universe of Levels(?) - ? Video Game Solution CD Release 2.0 - ? Violence Volume 2 - >1000? A few notes on my recent edit and the product. The contents appear to just be a copy of 3D Game Alchemy. I didn't get a sealed copy, but the book is pictured on the back of the box and the book fits the box just right. My copy didn't come with anything beyond the box and book with disc. The book is from SAMS, but the box says Macmillan Digital Publishing USA, so I changed it to this. I do not see the phrase "Instant Doom Levels" written anywhere on the box or book cover. 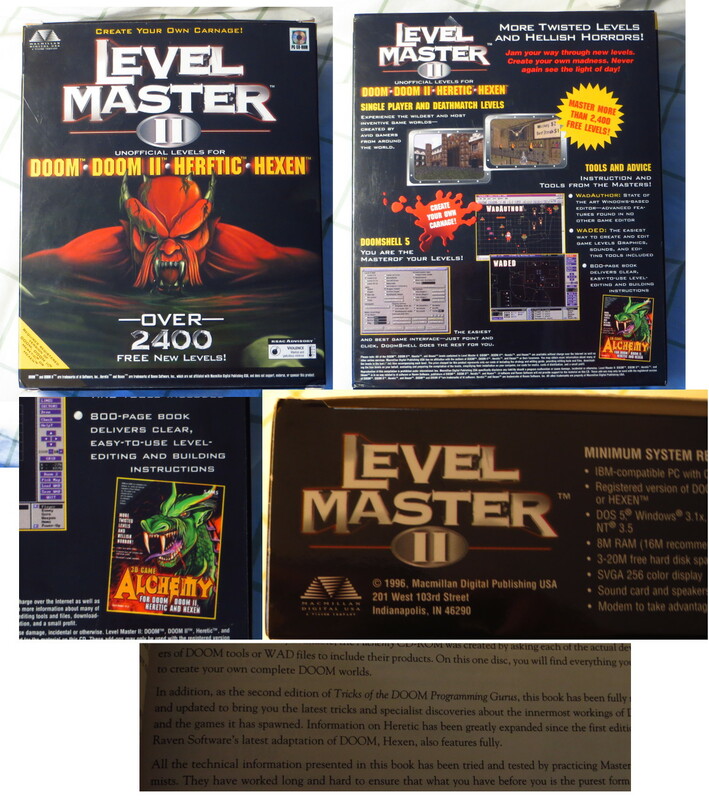 I have seen Level Master III, IV and V offered for sale on eBay/Amazon, but never just plain Level Master (I). This kind of bugs me since the Level Master II box does say "Volume 2" on the side. (I don't have 3-5, which are not Doom-related anyway.) What's with this? Was there really a Level Master I out there somewhere? Is it related to the previous edition of 3D Game Alchemy (Tricks of the Doom Programming Gurus)?